You can listen to 'We're alright now' here. John Hiatt is someone who is always there, never gathering too much attention, but enough to be noticeable. At 60 he released his 21st record since 1974, the first one I truly like since 2001's 'Little head'. My finest moment with John Hiatt is on a nightly kilometres long bike ride, probably more than slightly under the weather, between 03 and 04 AM, having celebrated my high school graduation. On my headphone a recorded live show cassette tape of John Hiatt that was broadcasted a few weeks before. An endless version of 'Riding with the king', bass pumping in my ears. Singing along loudly, no doubt, on this dark polder road between two villages, navigating the occasional oncoming headlights. It was years later that I saw Hiatt live in Paradiso in Amsterdam. Mystic pinball holds everything that makes John Hiatt so much fun to listen to. His raspy voice, supple flowing bluesy songs and ballads, stories to listen to and a few interesting lead lines in the different songs. 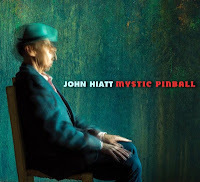 Where the difference between a good and a less interesting John Hiatt is in, is hard to tell. He does not do so much different, really. For me the difference is in the fact that when I hear a song is not up to par, for me that is, his voice becomes to dull. There is simply not such a song on Mystic pinball. In 'I just don't know what to say' the tempo goes down to mid-range. Immediately there is a sparse piano playing chords, a mandolin and a solo guitar with a nice reverb on it. A song so good that I can imagine Bob Dylan covering it some day, with a voice that is tainted even more. If the tempo and/or the noise is up, there is the same fine ear for musical detail. Opener 'We're all right now' is such a fine specimen. A fairly straightforward song with nice guitar accents livening the song up, as do the harmonies in the chorus. John Hiatt is a story teller. 'I know how to lose you' is so telling that I can see the scenes in my mind's eye. A brake-up song from an original point of view and insight. Friends that forget who you were with, probably always "knew", while the I personage hides his pain. Not that his songs are autobiographic by necessity. John Hiatt most likely is a good observer with empathy for certain situations. Mystic pinball holds a good balance between ballads, blues rockers and country rock. Every time a change is called for, Hiatt provides. This makes the album very interesting and pleasing to listen to. The major rest point on the album is provided by the ballad 'No wicked grin'. Not like his desperate hit in The Netherlands 'Have a little faith in me'. This song sounds resigned and slightly melancholy. As if Hiatt is singing to someone he loves or has loved that is there, right in front of him, but no longer really is, "A lonely old place where you have gone and gotten into". It all ends with the plain beautiful 'Blues can't even find me'. John Hiatt has made, as far as I'm concerned, one of his finest records. As I wrote, he's always there, but never scores big. Others do that with his songs for him. If Mystic pinball had one song with the quality on it like 'Perfectly good guitar' or 'Slugline', it would have been his best ever. Now it's a fine album, a damn fine one at that.